When I started Project Hug in 2012 at the Highlands of Dallas, I had no idea it would last this long. The annual Valentine's Day event is held on February 14th and our residents familiar with the cause were happy to see we were back at it again. This year we expanded to Meadows Health & Rehab Center because after five years it was time to grow and bring the day party to more seniors. As long as we had the need, the volunteers, and I was able purchase bingo prizes, cookies, and punch the party was on. 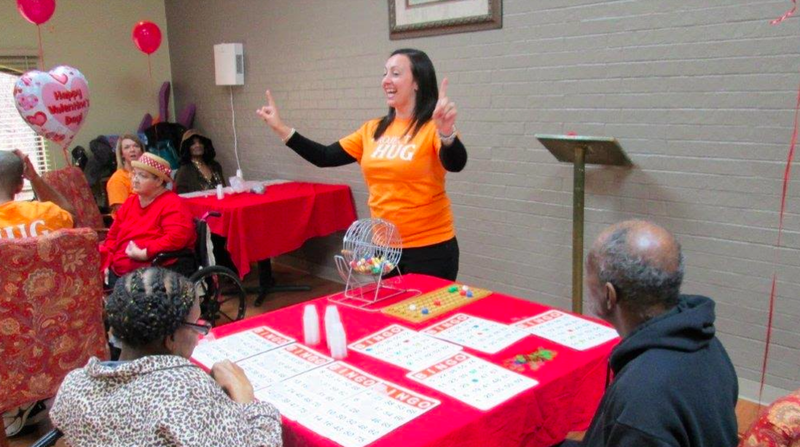 Meadows residents are younger than our Highland Center crew and they were more competitive during bingo. Willy, a resident at Meadows told me that he was not interested in eating my cookies unless I baked them myself. Fifteen minutes later, I talked him into one of the store bought cookies and a cup of Hawaiian Punch. He could not resist the soft sugar treat with smooth vanilla icing nor my pleading. Overall, I believe the Meadows and Highlands seniors, staff, and Hug Team Ambassadors had a good time. The day was a great reminder of what community means and how to spread love and be with people who are different from us in age and physical ability. A long life is a blessing and these seniors are still living it up. My husband and I attended the Dallas Mavericks game against the Cleveland Cavaliers on Monday. It was a high-intensity game with plenty of vivid highlights, but as we sat there, I could not help but think back to the dream I had when I was sixteen years old. The dream that inspired me to read the North Carolina Way by legendary Coach, Dean Smith when I was young. That same dream that fueled my passion to work in the sports industry. First, interning in college and then leading the start of two NBA developmental teams in my twenties. It is the same dream that led me to write my first book about breaking into the sports industry. It is the dream that found me Monday night in a crowded arena full of people working towards a unified goal - to win. Question: What was your major dream growing up? Unity, team, and achievement are why I fell in love with sports and why I worked for free as an intern selling door to door in the Texas heat inquiring if a business had a plan for their client and employee entertainment. My goal to be the first minority woman to be a majority owner of and NBA team has not died. I simply acquired another dream: to help others find their voice, to tell stories, to write. I believe our dreams never die no matter how far we move away from them. They wait until we are unafraid to reappear. What dream are you fighting for today? How I found hope as I watched the swearing-in of the 45th president of the United States of America. Literally! I will save you my color commentary and the full details surrounding my epiphany. But whatever you and I decide to do what the rest of our adult lives, it is by choice. It is purely, divinely, and wholly up to us and the choices we make each day with our lives whether we grow or stagnate. Listen, I understand upbringing, education, common sense or whatever else we tell ourselves, but with technology, a passion for devouring books, and courage you can be anything you want to be in this life - just ask President Obama, and now President Trump. If you look around today, there are examples of this truth playing out everwhere (Oprah, Bill Gates, Tyler Perry, Beyonce, and Steve Jobs). If you are wondering where to start your reading, begin here or here. The skills you don't have today you can gain tomorrow. Just get started. There was a lot that held me back in the past: my pride, fear, a tendency to people please and seek permission. All of these things, these labels, fail to the waist side when I realized and ACCEPTED who I was. As a Christian, Christ has already labeled me forgiven and set free. Holding fast to this belief means - who cares about what anyone has to say about my present or future. It means believing in myself and my ability to create beyond what my eyes can see. It truly means everything is possible. It means that you and I don’t have to be afraid to make mistakes, self-justify or hide from who we are. We learn and do better the next go round. Think about all the things you could do just in this minute alone, what about today, this month, or in a year? You could pursue things that encourage you and confirm the best parts of you. You could write a sonnet, author a book, or look for things online that make you laugh. You could also do the opposite of things that encourage, inspire, and uplift you. What I've come to realize in my twenty-nine years on this tiny blue planet, I can do many things with my life and time, but I must ultimately decide what I am destined to do and with every fiber of my being - do that. It took me awhile, but I now know my purpose – what about you? We are here for a very short time in the grand scheme of things. The sooner you discover your purpose, the sooner you can spend your life doing that. Here is a hint, if you are still searching, begin with your strengths. Now, this is the pendulum that all this ranting hinges own (don't let me ramble for no reason). You have to make a choice for your life. You must decide what you are going to do with this life of yours. May I suggest you choose life, choose freedom, choose to be prosperous in spirit. You don't have to be a product of your environment. You don't have to be a slave to dead beliefs and ideals. You don’t have to remain uneducated and stuck. Choose life, choose you. Choose life and all that comes with it - the good and bad. It's all part of your journey and will make you stronger. It could even make you president of this great country some day. Discussion: What will you decide? Where are you stuck today? Are you looking for solutions or making excuses?